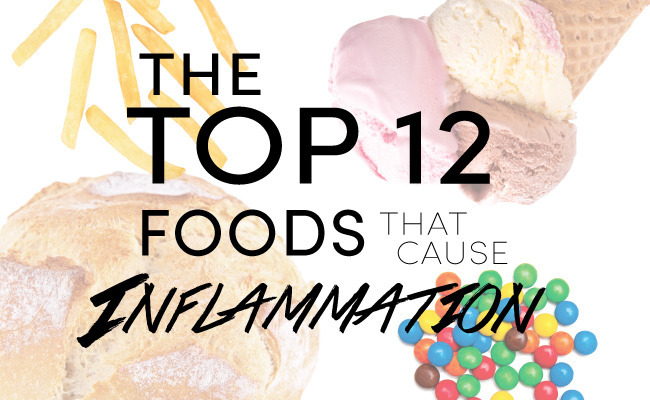 Everyday foods like bacon, eggs, coffee and dairy products are linked to inflammation. That might not sound like a big deal but when you consider that most chronic conditions like cancer, arthritis, diabetes, and obesity have been linked to inflammation. Low grade inflammation is a factor in most health issues. And if you suffer a pain disorder, you better believe that inflammatory foods will aggravate the condition. Many common foods in the Standard North American Diet can cause or exacerbate inflammation in the body. 1. What I call the “3 Ps”–Processed, packaged, or prepared foods. And, yes, fast food is atop the list of inflammatory foods thanks to the harmful oils, sugar and artificial sweeteners, food additives, and a whole host of nasty ingredients. 2. Hydrogenated and trans fats found in margarine, shortening, lard or products made with them. That includes baked goods, cookies, pies, buns. Of course there are healthier alternatives to these baked goods but most grocery stores and bakeries are using these harmful ingredients. 3. Meat (not wild-caught fish). I’m not suggesting that you have to go vegan or vegetarian here although a plant-based diet tends to be much lower in inflammatory substances but meat and poultry tend to cause inflammation so make them the background of your meals not the main dish. 4. Fried foods (French fries, onion rings, potato chips, nachos, hamburgers, etc.). I think these items speak for themselves. 5. White sugar and sweets, including soft drinks and sweetened juices. Newer research is showing that sugar is one of the most addictive substances you can use. It’s also highly inflammatory. No, you don’t need to eliminate sugar and sweets altogether simply reduce your consumption and choose fruit as your “go to” food when you’re craving something sweet. 6. Synthetic sweeteners (Nutrasweet, Splenda, saccharin, aspartame, AminoSweet, etc. )—research links these nasty substances to many serious health conditions. I avoid them like the plague. 7. Iodized Salt (use Celtic sea salt instead). Not harmful on its own but sodium is naturally found alongside other valuable minerals like potassium, calcium, and magnesium. Choose unrefined salt which naturally contains many different minerals, not just sodium. 8. Food additives: colors, flavor enhancers, stabilizers, preservatives, etc. Some of the main ones include sulfites, benzoates, and colors named FD&C #”X.” Unfortunately, many foods consumed by children are loaded with these harmful, toxic ingredients. 9. Dairy products (yogurt, ice cream, cottage cheese, butter, cheese, etc.). The reasons dairy products are inflammatory are too lengthy to list here, but today’s dairy products are packed with hormones, antibiotics, and other harmful ingredients so avoid them as much as possible. 10. Wheat products. Wheat is highly acid-forming and inflammatory in the body. Worse, most wheat available now is genetically-modified (GM). Many serious health conditions are starting to be linked to GM wheat consumption. 11. Other gluten-containing grains. Gluten is found in most grains and is highly inflammatory. Choose grains or seeds like buckwheat, quinoa, or millet for your baking. 12. Alcohol. High in sugar and a burden to the liver, alcohol makes the top 12 inflammatory foods list. It is best eliminated or used in moderation.